Successfully Added Bluetooth Adapter for Steering Wheel to your Shopping Cart. Bluetooth adaptor for vehicle steering wheels. 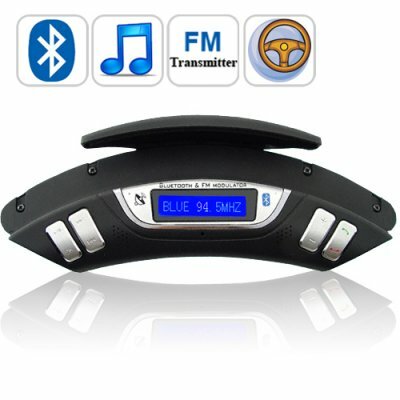 This unit has an FM transmitter plus built in MIC and speakers for handling your phone calls while on the road. A fantastic device to enhance your driving experience, this steering wheel Bluetooth adapter is both safe and convenient to use in your car, truck, delivery van, etc. Using the built in MIC and speakers or FM transmission, your phone calls are hands-free, allowing you to keep your eyes on the road while driving. Adjustable and fitting all sizes of steering wheels, the DIY installation is simplicity itself with no modifications required, just a simple clamp adjustment. With its classy, sleek look, this Bluetooth adapter has a built-in backlight LCD display for easy viewing of incoming phone call information. This is complemented by the user-friendly button controls to meet your call handling needs. This compact Bluetooth adapter remains conveniently available at all times while not being in the way. With SD card and USB slots, plus Bluetooth A2DP connectivity from your cell phone, streaming MP3 music from this device via FM transmission to your car stereo is also a great bonus feature you get with this unit. A great wholesale price makes this unit perfect either for the re-sale market, OEM market, or company/personal use. As always, it is available direct to you from the original source for wholesale direct from China electronic products, Chinavasion. Bluetooth hands-free operation to maximize both safety and convenience. Easy DIY installation, just a simple clamp adjustment. The inner foam rubber grips tight while onto the steering wheel. The Bluetooth unit exceeded my expectations and was blown away by the delivery time. Ordered late Tuesday arrived Friday midday - from China to Norfolk - unbelievable. Have ordered further goods and can thoroughly recommend. very fast shiping even with Hong Kong Post(5 days from China to Romania). on 2010-05-19 16:47:33 Great product! I purchased this product together with the Elevation phone. I'm absolutely satisfied with the product, it works as a great mini MP3 "Radio Station" together with the phone and its Bluetooth music transmission. Chinavasion is a master of electronics. very fast shipping .I like this products very much. The product was great and works fine! Thanks a lot chinavasion U rock ! on 2009-11-20 03:13:45 it is very good. chinavasion thank you for sending me the Bluetooth Adapter.